Build up a following for your business and products, and get useful feedback on what’s attractive by using the barcodes already on your products or in your environment. Barcodes are everywhere – just look at the products you buy everyday, or the books and DVDs on your shelves at home. Codes are also on posters, noticeboards and tourist sites (often as QR or Quick Response codes). Any product you sell can now be an object to have a conversation with the community you sell to. A customer scans the barcode and then leaves a message about how they used the product or what they think about it. Later other customers do the same thing, and over time a set of comments and discussions around your products and business are created. 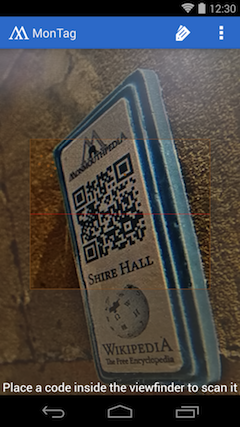 Your town council puts up QR codes on tourist sites (see Monmouth in the UK for an example). Local businesses and people in the community piggyback off this infrastructure, adding comments, suggestions and their own thoughts on where to go for a good meal, to buy a great leg of lamb or just to hang out. 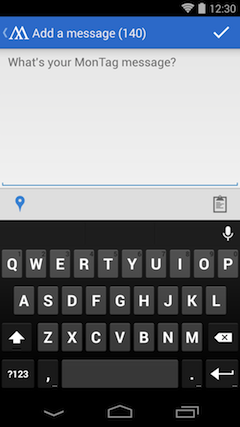 Download the app from Google Play to start scanning codes and adding your own messages. Or, make your own branded version of the app and let people comment on your products. 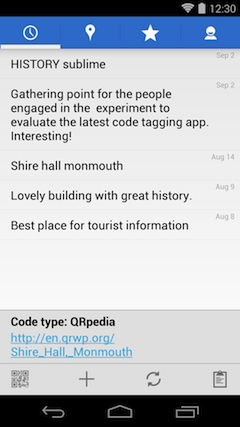 Try out the CodeTalk sample apps: MonTag and Q-arrgh!